Music, previously conveyed by writing, suddenly itself turns into writing. 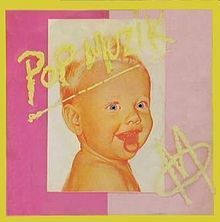 The UK 12-inch single version was notable for the A-side having a double groove such that the two tracks (“Pop Muzik” and “M Factor”) both started at the outer edge of the record and finished in the middle (with a long silence at the end of “M Factor” since the track was the shorter of the two). This resulted in a random selection of the two tracks, depending on which groove the needle landed in the lead-in. To further market this idea, the UK record sleeve stated “B side included on A side, full length disco mix of Pop Musik on Seaside”. ‘Seaside’ (in other words “C side”) was a simple play on words as the letter C, apart from being the logical next “side” after the A and B sides, is pronounced the same way as the English word “sea”, and “seaside” means “beside the sea”.